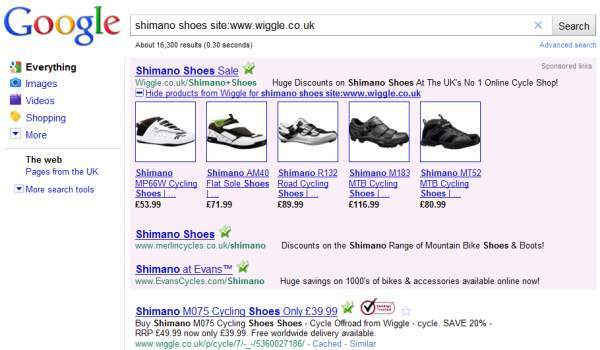 I was looking to buy some cycling shoes yesterday and searched for “shimano shoes” on my favourite cycling website. What I saw in Google SERPS was an AdWords “plusbox” ad – a relative newcomer that lives under the banner of Google AdWords Product Extensions. The AdWords Product Extensions feature lets advertisers showcase certain products that they have uploaded to Google’s Merchant Center. In short, when a searcher’s query matches a product contained in your Google Merchant account, your AdWords ad will display Product Extensions that relate to that search. This new format known as a “plusbox ad” may show the title, price and image of the closest matching product beneath the ad. Bear in mind product extensions will only appear on the Google Search Network and not other Search Network websites or the Display Network (formerly known as the Content Network). Advertisers can easily activate this feature in their AdWords campaign settings by selecting the Ad Extensions tab and then choosing Product Extensions as illustrated below. In terms of reporting, only “aggregate statistics” for the linked Google Merchant account is available. Performance data for each individual product is not currently available. Time will only tell whether this feature comes into its own, but we recommend you try it nonetheless.